In a typical home setup, the critical network functions DHCP and DNS are often provided by the home router. 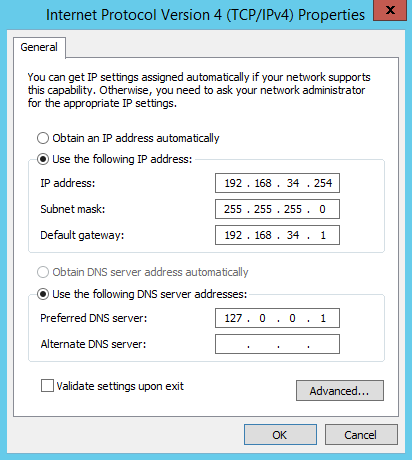 DHCP looks after the assignment of IP addresses on your network while DNS translates easy-to-remember names such as www.google.com into their respective IP addresses. For our Windows domain, we won't be using the router to provide these services. These services will be provided by our domain controller Hydrogen. Make sure you understand the network design for Unit34.co for this exercise. 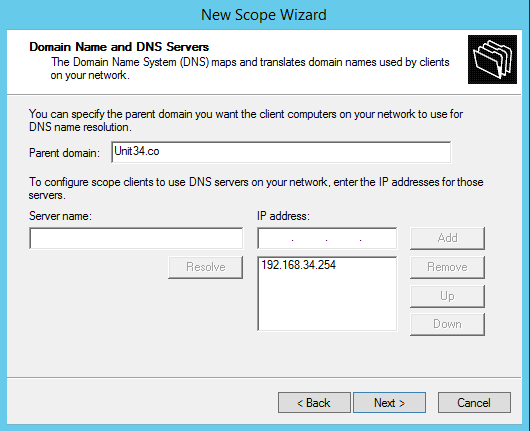 In this article we'll be looking at configuring DHCP and in our next article, DNS. Before we start installing and configuring DHCP and DNS on Hydrogen, there are two important things we need to do on our home router first. Configure our router with the static IP address 192.168.34.1/24. Disable the DHCP server on your router. Consult the manufacturer's documentation of your router for how to configure your router. 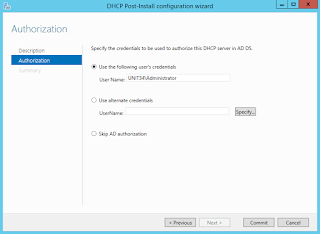 It is very important to disable the DHCP server on your router as we want our domain controller to be issuing IP addresses and not the router. The router can continue to provided DNS services as we may forward DNS requests to it later. Log onto Hydrogen. 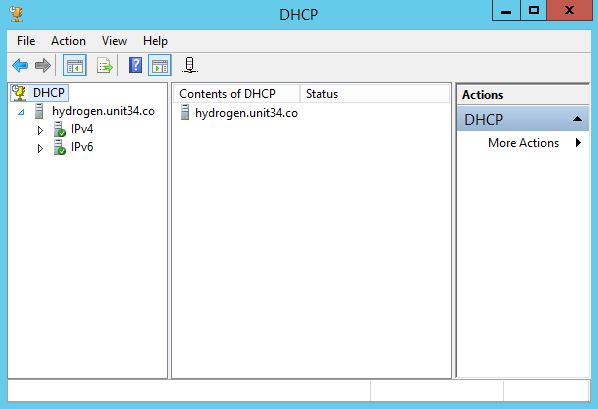 We'll be installing the DHCP Server role on our domain controller Hydrogen. Step 1. 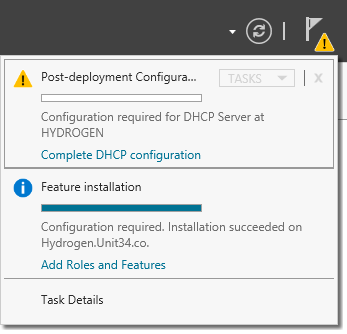 Configure a static IP of 192.168.34.254/24 for Hydrogen. Make sure the preferred DNS server is 127.0.0.1. This should have been set automatically during the successful installation of Active Directory Domain Services (AD DS). Step 2. 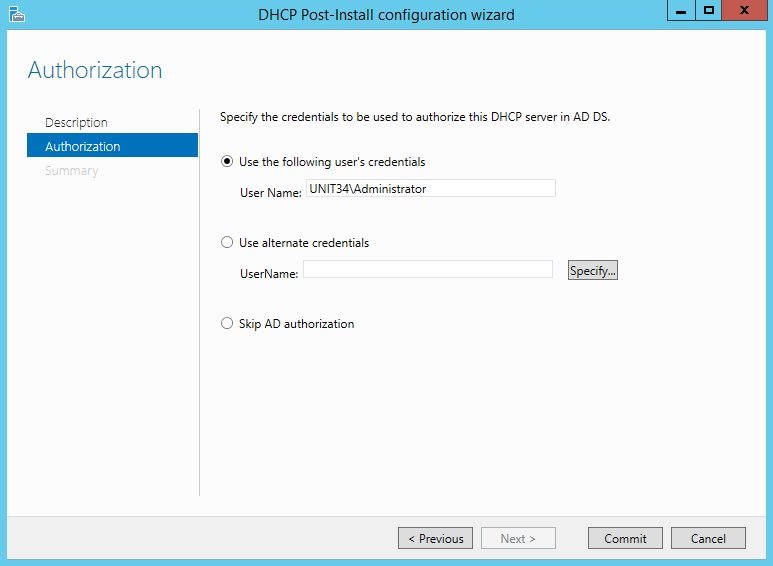 Just like you did when installing Active Directory Domain Services, install the DHCP Server role by using the Add Roles and Features Wizard in Server Manager. 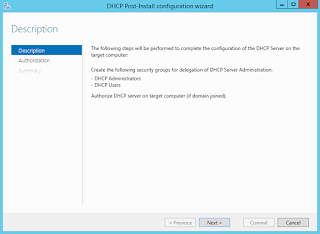 Once installed, go back to Server Manager and click on the flag icon in the top-right, select Complete DHCP configuration. Step 3. 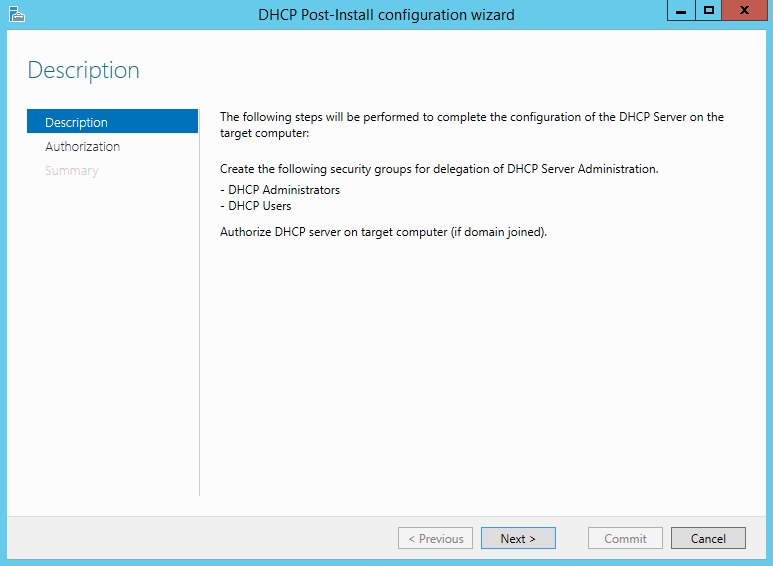 Complete the DHCP Post-Install configuration wizard to authorize the DHCP server for your domain. Accepting the defaults should be fine. Step 4. After completing the wizard, start the DHCP management console by going to the Tools menu in Server Manager and then selecting DHCP. Step 5. Right-click on the IPv4 node under hydrogen.unit34.co and select New Scope. Name the scope Unit34.co. Step 6. Enter 192.168.34.1 as the start IP address of the scope and 192.168.34.254 as the end IP address. Make sure the subnet mask is 255.255.255.0. Step 7. Leave the Add Exclusions and Delay page blank and click Next. Leave the Lease Duration page on its defaults and click Next. Step 8. When asked if you would like to configure DHCP options, select Yes, I want to configure these options now. Step 9. Add 192.168.34.1 to the router option. This will be the default gateway for all your DHCP clients. Step 10. For the Domain Name and DNS Servers options, make sure Unit34.co is specified as the parent domain and 192.168.34.254 is specified as the DNS server. Step 11. Leave the WINS Servers option blank and click Next. Step 12. Activate the scope and complete the wizard. [192.168.34.1] R0.Unit34.co - Which is what we've called your router. You need to find the MAC address of each host to do this. Adding reservations stops the DHCP server from assigning static address to other devices. Step 14. 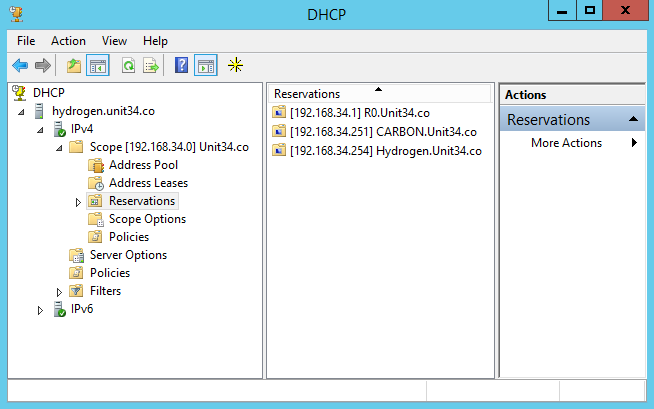 If the DHCP server isn't authorized because you skipped an earlier wizard, in the left pane of the DHCP management console, right click on the server hydrogen.unit34.co and select Authorize to start responding to DHCP requests.